The rainy season is fast approaching, but it’s still just as good time as any to enjoy ice cream. 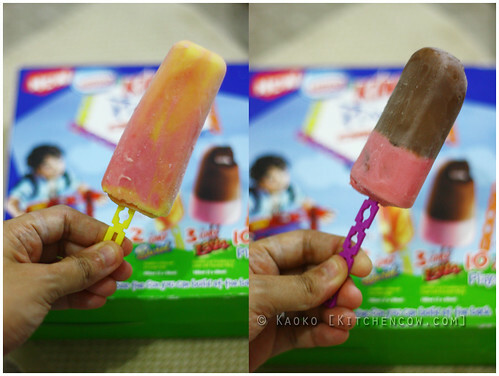 In this case, Kimy Ice Cream Sticks. I received a package from Kimy a week or two ago so I got to try Kimy Swirl, a fruity strawberry flavored ice cream stick and Kimy Lava, a split choco and strawberry stick with a frozen chocolate syrup center. Both flavors were great for a quick ice cream fix. What makes it extra special though, is the usage of Kimy playstix. These plastic sticks take the place of the traditional wooden popsicle sticks before doubling as a children’s building toy when they’re done eating. These things connect and lock so kids can make fun shapes and figures. 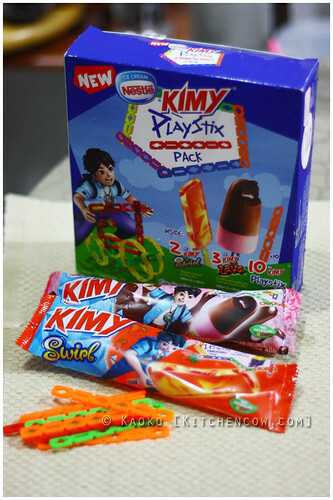 To jumpstart their Kimy playstix collections, parents can grab the playstix pack that comes with 5 ice cream bars and 10 playstix, giving them a total of 15 playstix to play with. Well, after they’re done eating their ice cream popsies at least. Kitchen Cow was given samples of the product for trial. No compensation was received.